An Old Bird Can Hatch A New Chick — Even At Age 65 : The Two-Way Wisdom, a Laysan albatross that researchers first tagged in 1956, has hatched what could be her 40th chick, the U.S. Fish and Wildlife Service says. Wisdom, a Laysan albatross that's believed to be 65 years old, and her mate have welcomed a new chick at the Midway Atoll National Wildlife Refuge. Here, a week-old chick peeks out from its nest. The chick was first seen coming out of its shell on Feb. 1, more than a week after Wisdom's mate had taken over incubation duties to allow her to fly over the sea looking for food. Officials at the refuge say Wisdom returned with a full belly — and then her mate took his turn to go looking for food. Wisdom is the oldest known bird living in the wild, the agency says — for years now, she's been mapping out new territory in our understanding about the upper limits at which animals can rear their young. It takes around seven months for a Laysan albatross to incubate and raise a chick — but the animals aren't exactly known for staying put: In fact, researchers don't think they set a foot on land except during the breeding season. They can travel hundreds of miles in a day and log thousands of miles in the air each year, using a massive wingspan of more than 6 feet to soar on air currents above the ocean. They can even sleep in the air, the Fish and Wildlife Service says. 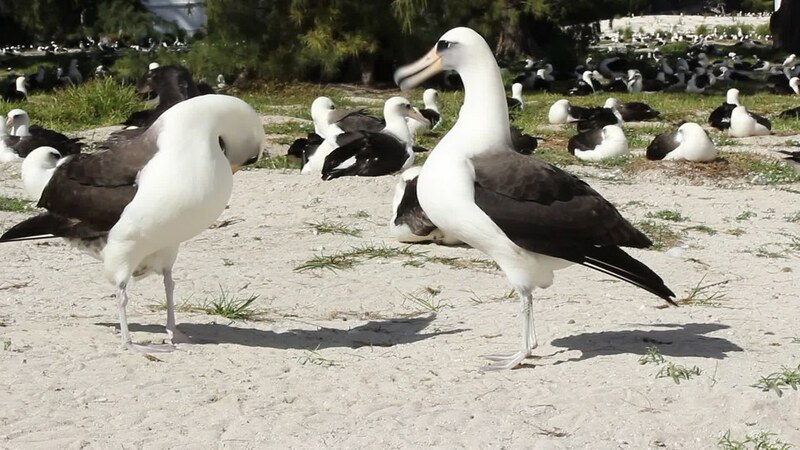 Every year, the birds return to their breeding grounds for a chance at producing one egg — and, if a recent video from Midway is any evidence, to catch up on albatross gossip and generally preen around. "Wisdom has raised at least eight chicks since 2006, and as many as 40 in her lifetime," the Fish and Wildlife Service says. "Just as astonishing, she has likely flown over 3 million miles since she was first tagged on Midway Atoll in 1956." That's enough mileage to account for up to six trips from Earth to the moon and back again, says Bruce Peterjohn, chief of the Patuxent Wildlife Research Center's National Bird Banding Laboratory. Wisdom isn't the only one in this story to show astounding longevity, Peterjohn says: "What is also miraculous is that biologist Chandler Robbins, who banded her as a breeding adult in 1956 on Midway Atoll, sighted her 46 years later near the same nesting location." Now 97, Robbins still makes occasional trips to the scientific stations where he worked for decades. 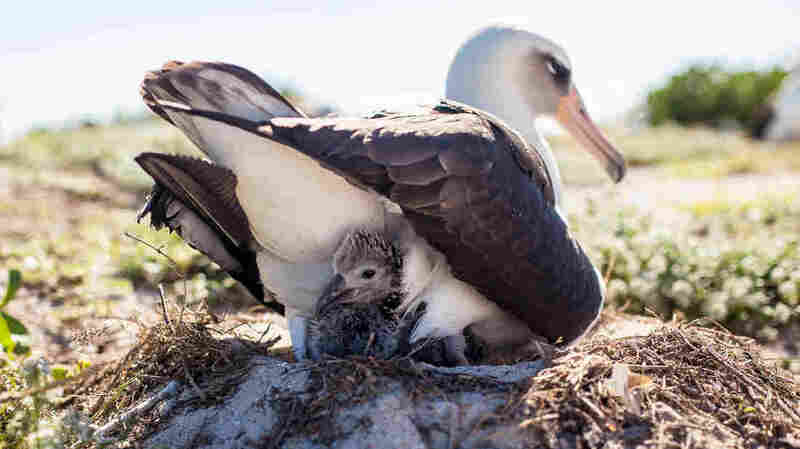 NPR has followed Wisdom before — as in 2011, when she survived a deadly tsunami that struck Midway Atoll, and in 2013, when she had another chick. News of the new baby bird comes one year after Wisdom suffered an accident in which an egg she and her mate had been incubating went missing. "Wisdom spent most of yesterday sleeping while she kept Kūkini warm in a drizzling rain. Today, both got to know each other and Wisdom assured Kūkini got a decent meal." If you're wondering about Wisdom's unnamed companion, the staff of the Papahānaumokuākea facility say they're holding a contest to name her mate — who so far is often known as "Goo" or "Gooo" — a reference to his band number of 6,000. But they'd prefer "a more distinguished name." "The polls will end soon so cast your vote for one of the top 4 choices of names from over 50 that were suggested or email Ann_Bell@fws.gov your choice from: 1) Ahonui (means patience in Hawaiian), 2) Endurance, 3) Popsicle, or 4) Akeakamai (means yearning for or lover of wisdom)."